Baltimore, MD - Monsters of HipHop, the world’s leading hip hop dance convention, today announced that DanceJam, the social network for all things dance, will be the title sponsor for the 2008-2009 Monsters of HipHop Tour. DanceJam is quickly becoming the world's favorite venue to watch and rate dance videos. With its innovative social community features, the site offers dancers and enthusiasts the ability to create unique profiles, upload dance videos and rate performances. Videos of individual performances and dance crews can be easily uploaded from online destinations such as YouTube.com. DanceJam catalogues dances and popular street moves, and includes video instruction for a variety of dance genres. "Our new sponsorship by DanceJam is a win-win for both parties," said Andy Funk, the founder of Monsters of HipHop. "DanceJam saw Monsters as number one in HipHop dance events, and we see DanceJam as the front runner in online dance field. Together we can expand our reach and further build our brands as leaders in the world of dance." As the title sponsor of Monsters of HipHop conventions, with their 13 city U.S. tour through cities such as Los Angeles, Chicago, New York, Denver plus new international destinations Mexico, Japan & Europe, DanceJam will showcase exclusive dance footage, competitions and contests for convention participants. As leading innovators of hip hop dance instruction, Monsters of HipHop participants will benefit directly from DanceJam with new, online tools in development. Monsters' performance groups are able to use the community features of DanceJam for video critiques and comments to improve their performance and showmanship. Monsters faculty are notable dance choreographers who work with Justin Timberlake, Britney Spears, Pink, Jay-Z, Beyonce, Janet Jackson, Mariah Carey, Jennifer Lopez, The Pussycat Dolls, and many more. They have been the creative force behind blockbuster dance films such as Stomp The Yard, Hairspray and Step Up 2. Monsters of HipHop freestyle battles will be taken online to a new arena. This new channel will increase overall participation and visibility for tomorrow's dance superstars. According to Geoffrey Arone, the CEO of DanceJam, "Our relationship with Monsters of HipHop allows us to engage and work with the top dance talent in the world today. Monsters' access to casting agents, talent scouts, and TV show executives allows our community to literally dance their way to fame." Founded by Andy Funk, Becky Funk and Angie Servant in 2003, Monsters of HipHop is the conceptual blend of competitive dance, business and marketing. While Monsters has grown tremendously, the company strives to maintain the family environment on which it was built with its mission to bring hip hop dancers together with the industry's top dance professionals in a fun and challenging environment that fosters self-fulfillment and career development. DanceJam was founded by M.C. Hammer along with visionary Internet entrepreneurs Geoffrey Arone and Anthony Young from Flock.com. The current popularity of dance globally is evident by the success of dance television shows such as 'Dancing with the Stars,' 'So You Think You Can Dance, ‘America's Best Dance Crew' and online videos such as 'The Evolution of Dance'. 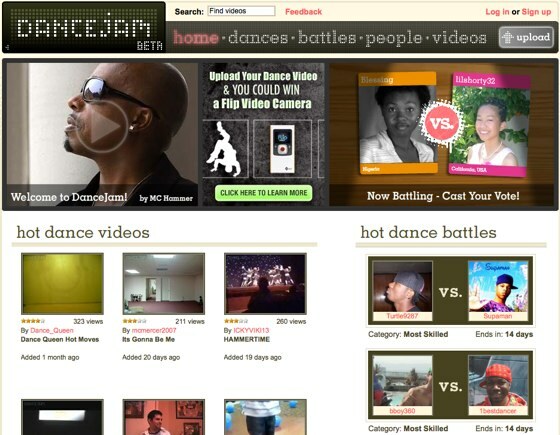 DanceJam's founding trio saw an opportunity to create a niche video site focused entirely on dance and dance culture. From this, DanceJam was born, created to cater exclusively to the growing community of dancers & their fans. Salsa Wild of The Falcon and Doves Dance Troupe . The audition moto of this dance troupe is Experience helpful, but note necessary, in as much as each member is auditioned for which assigned division - Amateur - Pro Amateur - Professional. A full cultural affirmative developmental program. Latin Dance Classes Baltimore, Maryland . Dance is Fun in Baltimore, Maryland . Ballroom Dance Class / Classes ( Student Ithaca Notes ). The Latin / Salsa Dance Cities. Latin Dance Class / Classes ( Student Ithaca Notes ). Mambo Dance and Dance Classes. Samba Dance and Dance Classes. Ithaca Swing, West Coast Swing, and Lindy Hop Dance Classes ( Student Ithaca Notes ). Dance News, Services, and Products. Dance Ithaca E - Magazine. Latin / Salsa Dance Dresses.